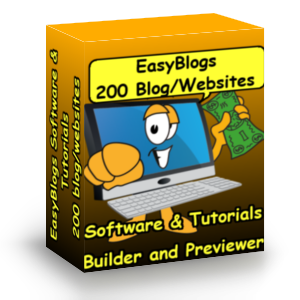 Frequently Asked Question (faq) about EasyBlogs software and tuturial. Please be sure to read these faq - frequently asked question before you post a support question. Your question may have already neen answered if you read the frequently asked questions as they are posed carefully, then you will most likely find the same question as yours. 98% of all support questions have already been covered so, again, read through these carefully to be sure that your question has not already been answered. 1. How Do I open my blog after I have closed down the software? 2.How Do I put a list of links on my side bar of my News Blog pages? 3. How Do I add a picture to my entry? 4. How Do I modify templates? 5. How Do I change my template? 6. What is the page in my EasyBlogs folder with the string of numbers? 7. I am using the evaluation version of Easy Blogs and my RSS feed does not validate and has errors. 8. My Google AdSense codes are not showing up on the home page of my blog. 9. After I uploaded the files, I noticed that at the bottom of my blog page, I only see an archive link for last month. Shouldn't there be one for the current month? 11. I am storing my blog pages in a different folder than the default folder in Program Files, but the page are not there. Where are they? 12. How do I limit the number of items on my article or category index page? 13. I am posting entries to my blog but none of these entries are showing up on my blog home page. 14. How Do I Back Up and Restore My Backup for my .zdb file of my blog(s)? 15. My Computer crashed and I didn't do a backup. What do I do now? 16. My homepage is not displaying my blog posts. How come? 17. Can I delete my blog and start over? 18. I cannot view Preview on my computer. Why not? 19. My blog home page and/or other pages do not have keyword and description meta-tags. 20. Do I really have to re-upload every single page when I modify my template? 2. My Look and Feel Template for Sports and Recreation does not look right. 3. I use my own HTML upload template. How do I match my blog to the rest of my website? 4. How do I center my blog pages now that I have centered by Look and Feel Template on my website? 5. I don't like the way something looks on my pages. Can I change it? 6. I cannot find the template files when I open the Template Editor in the Easy Blogs software (or I get an error message). 7. How do I code my articles pages with such things as AdSense, comments, meta tags and autodiscovery? 1. How Often should I add entries to my News Blog? 2. How Long should my entries be? 3. Should I worry about keyword profitability when I am blogging? 4. What Do I put in my blog, anyway? 5. How do I keyword code my blog entries? 1. What Is a ping and do I need to worry about pinging? 2. Pingomatic website s not available or I cannot get the Pingomatic website. 3. Do I need to ping if I am using RSS Announcer to list my blog in directories? 4. How often should I be using RSS Announcer? 1. I am confused which pages I upload each month and which ones I don't upload. 2. I uploaded my page but it doesn't show up on my website. 3. Do we upload the xml page during the month or only at the beginning of the month? 4.I was trying to upload a page and got an error from SBI uploader saying that it cannot upload that page because it's got errors on it? 5. What Does it mean when I get a message in the Quick Re-Upload Results after trying to re-upload a page or pages using Quick Re-upload It! that says I can't RE-upload a page until I -first- upload it? 6<. I get the messages "files are not referenced in the XML document" when I try to upload my RSS/xml file in RSS It! 7. XML It! is giving me the following error message: "Sorry, one or more files from your domain that you have selected are NOT referenced in your XML file. You cannot upload the following files through "XML It!" c. This applies to all kinds of cases, if you are finding that there are missing pages on your website that should be there. 9. Why can't I use QuickReuploadIt to re-upload my RSS/xml feed? 10. There is a file called, recent.html in my Easy Blogs folder. What do I do with this? 1. What Do I do if the links for my blog in My Yahoo don't work after I add my RSS feed to the Yahoo Feed Directory? 2. My RSS feed on My Yahoo home page is not updating after I ping. What is wrong? 3. When I click on my entries links in MyYahoo (or any other RSS feed reader), I get a no URL page. 4. How come I don't find my RSS feed listed in the Yahoo RSS directory even after I have added it to the directory? 1. If we put Google AdSense on our blog page and we offer syndication to other sites will our Google AdSense ads appear on their sites? 2. Can I Put more than one blog and RSS feed onto my SBI site? 3. I am using an SBI template and I want the Navigation buttons from my SBI site to show up on my blog. 4. In Search Engine HQ, I am getting this, "custom keywords by default" for my keywords. How do I fix this? 5. Can I insert AdSense code directly into an entry box when creating an entry or article for my dedicated blog? 6. Do I still use the Easy Blog rss feed or just use RSSIt's feed from now on? 7. Should I take the orange RSS button for the Easy Blogs RSS feed off from my blog template and put the RSSIt button there instead? 8. Do I need to re-submit my rss feed to RSS directories more than once? 9. How do I get rid of the RSSIt orange button on the left nav bar? 10. How do I remove the Easy Blogs orange RSS button from the blog pages? Q1. How Do I open my blog after I have closed down the software? A. Open the EasyBlogs2 folder in the Program Files menu on your computer. You will see the button, 'Open Blog' on the screen. Click on it and find the .zdb file that you named in Step 2. on TUTORIAL II : Setting Up Your News Blog. Q2. How Do I put a list of links on my side bar of my News Blog pages? A. See how to use static pages to create links in Appendix II - Advanced EasyBlog Features or see Help in the software that explains how to do this. Q3. How Do I add a picture to my entry? A. See Add A Picture To Your Entry in Appendix II - Advanced EasyBlog Features or see Help in the software that explains how to do this. Q4. How Do I modify templates? A. Changing the templates requires some comfort with HTML coding. You will need to go into the template and recode the changes in the HTML. To do it yourself, start with the tutorial:Understanding How The Easy Blogs Template Works before proceeding at your own risk. 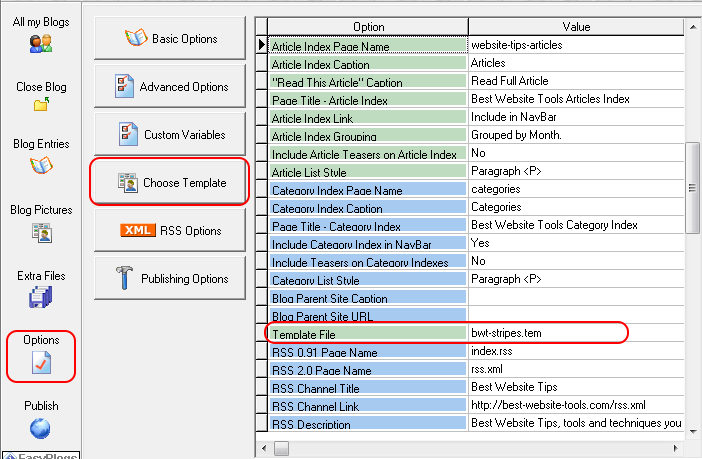 To modify a template, go to All My Blogs ==> Template Editor ==> Open. Choose a template from the list and make your modifications in the html code of all sections of the template. Before attempting modifications, I suggest that you copy your current .tem file and save it out of the Easy Blogs Program Files folder for safe keeping. Then make changes to the one in the program files and if you mess the html coding up to badly, delete the file in the program files and replace it with the safe-kept one. I do support any personal modifications to the templates such as changing the way something is displayed on the pages If you want something changed, then I will work with you by email for a fee. Contact Me for this service. Q5. How Do I change my template? A. Go to Options ==> Choose Template and choose a new template from the drop down list. You MUST use ONLY a template that has been customized specifically to work on an SBI website. See SBI Rss Templates to get one from us. Templates can be changed at any time. If you want your own custom template please contact us for help with integration. NOTE: Once you have changed your template, you will need to re-publish, re-generate, and re-upload ALL Pages already uploaded to your website. Q6. What are the pages in my Easy Blogs folder with the string of numbers? A. The software generates a numeric number for each monthly (or weekly or daily - depending on how you set up the Basic Options for "Frequency of pages" in Tutorial II of the SBI Rss Tutorial) page. Monthly pages are numbered with the year first and month second. Ex: Dec is 200412. Weekly pages are numbered with year first, month next and then whether it is week 1 or 2 or 3, etc. As you can imagine, daily pages would get really confusing when it comes time to re-upload. Hence, my suggestion that you only generate a monthly page for ease of re-uploading every time your make a new entry. Q7. I am using the evaluation version of Easy Blogs and my RSS feed does not validate and has errors. A. The error is a problem with the evaluation edition only. It is incorrectly adding an "evaluation edition" notice to the end of the rss.xml file. Just recreate your site with the full version and it will fix itself. If you have a trial version you will need to purchase the upgrade to the full version. A. Please read the tutorial:Understanding How The EasyBlogs Template Works . When it comes to following the Mini-Tutorials and inserting specialized code into the pages of your template, you need to really read this tutorial to be sure you have included the code on all pages of your blog! Q9. After I uploaded the files, I noticed that at the bottom of my blog page, I only see an archive link for last month. Shouldn't there be one for the current month? A. No, The link at the bottom will only shows the prior month used that is not shown on the blog page. The code for the 'prior' and 'next' month in the archive only appear IF they already exist. Note: the prior-next code does not show on article, static, hidden, free format or the home page(s). It only shows on the blog page and the archive pages like monthy or daily pages. If people want to see the other entries for this month (or previous months), then they can click on the 'archive.html' page in the navigation menu of your blog. Q10. How Do I change my settings that I originally set up Tutorial II : Setting Up Your News Blog in the manual? These settings include changing your blog title, from monthly to weekly frequency, changing link captions and web page/file names, RSS options, etc. A. Go to 'option settings' tutorial to change any of the options that operate your blog. Q11. I am storing my blog pages in a different folder than the default folder in Program Files, but the pages are not there. Where are they? A. If you find that there are no pages in your folder, then you have not remembered to do the additional step of clicking the button: Publish to The Web. You MUST do this every time that you Publish and Generate the pages of your blog for them to show up in the program file.. Revisit the tutorial and see the Warning box regarding this issue. Q12. How do I limit the number of items on my article or category index page? A. Right now this cannot be done. I have spoken with the Easy Blogs developer and hopefully, this will be an option in the next update of the software. You can elect to not include article teasers on these pages. In OPTIONS==> ADVANCED OPTIONS tab deselect "include teasers on article page And deslect it for 'Category' Pages as well. Then only the title shows and is linked to the articles. Note doing this reduces duplicate content on your website. It also makes these pages more like a sitemap of your site. Q13. I am posting entries to my blog but none of these entries are showing up on my blog home page. A. In the Setup for your blog, step 3a, I said to select Yes to the question, "Would you like to see recent entries on your blog home page." If you selected 'No,' these entries are not going to be visible on your home page. Instead they are included on the 'recent.html' page. To correct this, go to Advanced Options in the blogging software once you have opened your blog file into the software and find the section for 'Home Page Name.' See the box labeled. "Show Recent Entries on Home Page?" Check it. Then be sure to re-publish, re-generate in the Easy Blogs software. Then use Quick Re-upload to re-upload your blog home page. Q14. How Do I Back Up and Restore My Backup for my .zdb file of my blog(s)? A. This is really simple. Open your blog, go to "All my Blogs" page, then select the blog you want to back up and click on "Backup Blog" button. Remember to Backup OFTEN! Q15. My Computer crashed and I didn't do a backup. What do I do now? A. This is complicated since so much depends on how you restore your computer. If it comes to the point where you cannot restore your Easy Blogs program files and folder when you do a complete system restore, then you will have to do some manual work. Go to Easy Blogs start page, open the help files and follow the instructions for "Repair Blog File." To restore from an existing backup file. You can change the extention. The most recent backup file can be fount as 'BlogName.~1' Change this to 'BlogName.zdb' It will replace the existing .zdb file so be careful. Only do this if your blog is unrecoverable. I have only had to do this once in ten years. The system is very robust but power shortages can take a toll. I have re-created blogs from scratch due to computer loss. 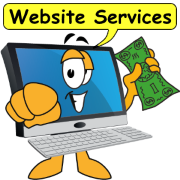 In these cases your website host has a downloadable copy of all your pages and other important content. Please 'request a consultation' for advice on how to do this. Q16. My homepage is not displaying my blog posts. How come? A. During the blog setup for the newest version of Easy Blogs (released Jan. '08), in Step 3a. Question 1 of 5 : Would you like to see "Recent Entries" on your home page? You were supposed to say "Yes: to the question. If you didn't, then the entries won't show up on your home page. To fix this, go now to Advanced Options and (once you have opened the your blog into the Easy Blogs software) and make sure that the box is checked for "Show Recent Entries on Home Page" under the section for the Home Page. Q17. Can I delete my blog and start over? A. The answer to this depends. If you are in the very early stages of building your blog, then yes, you can start a new blog. Just remember that you have uploaded pages to your SBI site and that you will need to RE-upload the new pages to overwrite the other pages of your previous blog. Be sure that you delete any pages that you have uploaded to your SBI site from the old blog that are not included in the new blog. You don't want any orphan pages (pages without links pointing to them) sitting on your SBI site. 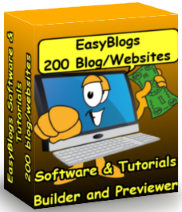 Just so you know, the Easy Blogs software does not store your blog, per se. Rather, every time you create a new blog, a new zdb file is created. Just start again and rename the your blog file differently and you will then be starting over. Then, I suggest that you go to where the zdb file is stored in the Program files for Easy Blogs and delete the old zdb file so you don't get confused which file is which. Q18. I cannot view Preview on my computer. When I generate a page, then try to preview it, all I get is a text editor full of html language. A. Basically you have to get into folder options under Windows Control panel, select the "file types" tab, scroll down to the "html" extension and change the "opens with" option to "internet explorer" (or your favorite browser). Q19. My blog home page and/or other pages do not have keyword and description meta-tags. Please download the newest version of the tutorial and see the chapter in the tutorial called, "Mini-Tutorial : How To Insert Keywords/Description Into Your Template" of the SBI Rss Tutorial. See also article meta tags and this tutorial custom variables. Or you can view and follow the tutorial, Add Keyword and Description Meta tags To All of Your Pages Generated in Easy Blogs and that you have inserted your Custom Variables in Advanced Options toset your default keywords and description. REMINDER: You will need to quick re-upload all the pages of your blog so that your blog pages are coded correctly for the search engines. Q20. Do I really have to re-upload every single page when I modify my template? A. That depends on the severity of the change you made. Remember that the pages are 1 of 3 types. There are "article", "default template" and "home" pages. Obviously if you only change one sub-template you only need to re-upload those types of pages. Major changes would include a look and feel changes, layout changes and navigation updates. In this case you would want to re-upload every page. Minor changes would include adding advertisements, images, widgets, etc. In this case these additions may only affect certain pages. So, you would only need to upload those pages to your website. Keep in mind that a article, archived and static pages are rebuilt every time you click on the "Generate Pages" button. You may not want to change some of those pages anymore so you simply don't re-upload them. Tip: Take your time re-uploading all your pages. This can be a tedious task but the search engines might think you are a page spamming robot if you upload too many pages too fast. I usually re-upload 4 to 8 pages at a time and space those out by at least 2 minute intervals. Q1. My graphics in my customized Look and Feel template don't look right or are not showing up on the page (ie. I get a box with a red x). A. If you have trouble with your customized graphic showing up or trouble with how your template looks, then check whether your logo and/or your side bar graphic file names match the file name in the blog template. You do this by opening your page in a browser and right click on the small box with an 'x'. Select view properties and check the file name such as logo.gif. Now, go to the home page of your SBI site and right click on the top banner/logo graphic or the left menu graphic (which ever ones are giving you trouble). Note the file name(s) and locations of these graphics that are working on your main SBI template. Then, simply go to the template editor in the Easy Blogs software and find the 'image' file and change to the same file name as the logo/side banner graphics on your home page. This problem often arises in templates that have installed their own graphics. In the installation of your own graphic, the standard name of the top banner log and left menu graphic have been changed to something different than the original SBI Look and Feel template. In this instance, you will have to code the blog template to match YOUR image file name! Be sure to read the tutorial: Understanding How The EasyBlogs Template Works to make sure you code both the home page, article page and the default page of your blog template. Note: In the "sbi-template-customized-left.tem" there are 2 instances of the LEFT.gif. You will have to find both of them and replace both with leftimage.gif or with your custom images if you have them. Once done, re-publish, re-generate and re-upload all pages and be sure to refresh your browser to see the changes. Q2. My Look and Feel Template for Sports and Recreation does not look right. A. This problem should now be fixed on all new template downloads. If not, then you will have to play with the table settings in the html coding for the template. Q3. I use my own HTML upload template. How do I match my blog to the rest of my website? 1. Pick a template that from the non-sbi look and feel templates provided for you in the membership site that is close to your site design. You can change colors and easily substitute a picture in any of the templates with one of your own so you are not restricted to keep that picture if the rest of the template has the colors or design that you like. 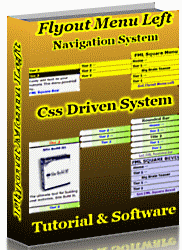 This is covered in Appendix II : Advanced EasyBlog Features of the SBI Rss Tutorial. 2. If you want to use your own existing html template, then, you will have to get into the codes that run the blog and insert the commands from the drop down box in the template editor of the software. To know which command to use or to figure out what the placement holder (i.e. command) is, then study the other templates and their codes. In essence, you will be building your own template so use the directions for that in the help files of the software. (Open up the template editor/packager and then click on the help button at the top of the panel.) IN ADDITION, be sure to read the tutorial, "Understanding How The EasyBlogs Template Works" if you attempt this on your own! I offer this service for a nominal fee. You only need to supply me with your look and feel template and I can build for you a custom Easy Blogs template. Contact me for a quote. Q4. How do I center my blog pages now that I have centered by Look and Feel Template on my website? A. I have not figured out a way to center your blog pages so that they will look good on all size monitors. There is some HTML coding that I have tried but the NAV buttons don't seem to want to center along with the rest of the page. So you should just keep your blog to the left even if the rest of your site is centered so that your blog will look good on all monitors. Q5. I don't like the way something looks on my pages. Can I change it? Changing the templates requires some comfort with HTML coding. You will need to go into the template and recode the changes in the HTML. To do it yourself, start with the tutorial: Understanding How The EasyBlogs Template Works before proceeding at your own risk. See FAQ above for more info. I am sorry but I cannot support any personal modifications to the templates such as changing the way something is displayed on the pages. If you want something changed or you need to fix something that you broke while making your own modifications, then I will work with you by email for a fee. Contact Me for this service. Q. 6. I cannot find the template files when I open the Template Editor in the Easy Blogs software (or I get an error message). First, did you place the template in the Easy Blogs folder in your Program files? If so, then did you unzip the file and extract the .tem file into the same folder? Read How To Navigate Your Computer and Find Your Dedicated News Blog Pages For Uploading to learn how to get around your computer and check the Easy Blogs folder in the PROGRAM FILES to see if you got it in the right place. You'll see a whole bunch of templates so look carefully for the template that you downloaded from the template page. Second, are you sure you are opening the .tem file and not the .zip file? Q7. How do I code my articles pages with such things as AdSense, comments, meta tags and autodiscovery? A. See the tutorial, How To Code The Article Pages of Your Template To Include Metatags and Google Adsense in the Body Of Your Article...plus add comments and autodiscovery to your articles, too! Q1. How Often should I add entries to my News Blog? A. As often as you can! More than once a day, even. Once a day is good and 2 - 3 times a week is alright. 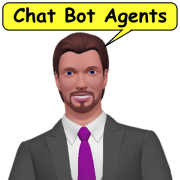 The more entries you add, the more chances that you will be found in the search engines...and remember to ping after each entry is uploaded to your SBI site! This is the standard answer for new bloggers. Once your blog is established you might consider using your blog as a way to build a category an ebook or the whole website. Think about this, If you are creating a series of articles for your upcoming ebook you could do this on Easy Blogs and have it all categorized and managed by the content management system. Q2. How Long should my entries be? A. It's best to figure on adding around 75- 150 words or one to two short paragraphs of new information to be sure that your content is seen by Google and the other search engines as new information on the page. Q3. Should I worry about keyword profitability when I am blogging? A. When you set up your blog using "TUTORIAL II : Setting Up Your News Blog" of the SBI Rss Tutorial. I suggested that you use your primary keyword phrases as the title of your blog and in the page/file name of your blog. After that, you can think about inserting other related keyword phrases in the titles of your entries and maybe once in the content of your entry. Then, after that, I wouldn't worry about profitability. Rather, grab keyword phrases from your brainstorming list and use as many as you can. That's the power of having an-onsite blog. Adding short entries on a regular basis means that you have a method to use all the keyword phrases that you always wondered how you could fit onto your website! Q4. What Do I put in my blog, anyway? A. Find 9 good ideas to fill up you blog with good pre-selling content in my article: "What The Heck Do I Put In My News Blog?" Q5. How do I keyword code my blog entries? 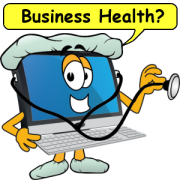 You cannot keyword code your individual blog entries. Only articles can be keyword coded and you do that using the second tab in the HTML editor called, Meta Tags. See this answer for more on this. Q.1 What Is a ping and do I need to worry about pinging? A. A ping is a small message sent from one webserver to another. Your blog sits on the SBI webserver. Other websites sit on other webservers. They can all talk to each other through pinging. To learn just how easy it is to ping! Q.2 When I went to the Pingomatic website, I can't access their page or I am getting some error message. What's up? A. The Pingomatic website can be down on occasion. UpdatePingOmatic has been very stable as of early 2017.Try this: Add PingOmatic to your favorites in your browser. Then you can get to it quickly when blogging. Q3. Do I need to ping if I am using RSS Announcer to list my blog in directories? Not really. You see, once you are in the directories, you will find that the directories somehow do this for you. I have forgotten to ping my blogs and still find that the RSS feed updates in My Yahoo. It does seem to take longer but still, one can not ping and you'll find your blog info still updates quite nicely on the net. Even with auto-discovery code in your template your posts may not always get noticed. If you ping a service like PingOmatic any new service will be added and any out of service will be removed. Q4. How often should I be using RSS Announcer? It's gotten to the point where some directories will ignore a ping if the feed has not been submitted to their directory. It is also the case that these RSS Directories will periodically clean out their directories due to abuse by all the blog and ping methods over the past years. So, the bottom line is to be sure to RE- submit the rss.xml feed to the directories every other month or so. I wouldn't do it more than once a month since all things can be over done. See the tutorial on using RSS Announcer and find the download for this software that came with your package. If you missed downloading it, please contact me. Q1.I am confused, which pages should I upload each month and which ones I don't upload? A. PLEASE, read the EasyBlogs Page tutorial that explains this! Q2. I uploaded my page but it doesn't show up on my website. A. Please re-read and follow ALL of step 7 in the TUTORIAL IV : Uploading Your News Blog Pages of the SBI Rss Tutorial. You must BUILD your page.....not just upload it! (I have answered this question repeatedly. READ and FOLLOW Step 7b...you are missing a step that is clearly listed in the tutorial!. Q3. Do we have to have to upload the xml page *during* the month? or only at the beginning of the month? A. You have to upload the xml page each time you make an entry. If you don't do this, then the RSS feeds pulling your entries will not show the latest entries made. Q4. I was trying to upload a page and got an error from SBI uploader saying that it cannot upload that page because it's got errors on it? 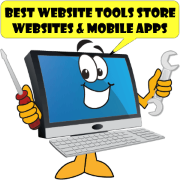 I have found that the error: Your "xxxx.html" file cannot be uploaded because it contains one or more errors that will adversely affect its performance in your visitors' browsers, occurs most often because the template is missing a key piece of code. Most probably a syntax error has occurred. Solo Build It has much improved this error call over the years. Most errors are now listed on the UYOH page. Making trouble-shooting the template much easier. There is a danger in trying to add additional code to your template in that if it is inserted in the wrong place or an incomplete coding occurs, then it cannot be uploaded. To correct this, you will have to do everything having to do with the template all over again, starting with TUTORIAL I: Downloading Your SBI Customized Template of the SBI Rss Tutorial. Then you will have to re-insert your Google AdSense and Haloscan codes and go from there. Be sure to re-publish, re-generate and re-upload ALL pages of your blog to your SBI site....that's ALL pages! 2.. You did not follow Step. 3d in TUTORIAL II: Setting Up Your News Blog and you are not using an SBI template. Make sure that you have ONLY an SBI template chosen for your blog. To check your template, go to Options and look for the line that say: Template File. The only thing that should be in there is a file that begins with "sbi." It should say something like: sbi-template-xxxx.tem. If it is anything other than an sbi template, then see Q5 above. Q5. What Does it mean when I get this message in the Quick Re-Upload Results after trying to re-upload a page or pages using Quick Re-upload It!? A. SBI gives you that answers quite well when they say: "QRI! can only be used to re-upload HTML pages that have first been uploaded via the HTML Compatibilty module." This means that you did not succeed or have not attempted to upload new pages for the first time. Please read this tutorial. Getting Familiar With The Pages That Are Generated by EasyBlogs......including what and when to upload and RE-upload, for better understanding of what pages need to be uploaded when and how. Q6. I get the messages "files are not referenced in the XML document" when I try to upload my RSS/xml file in RSS It! A. You have not uploaded ALL the pages! Re-read Tutorial IV in the manual about getting your pages uploaded. You stopped at Step 7 and did not do Step 8. 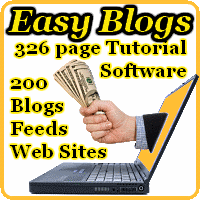 In addition, be sure to read the tutorial called, "Getting Familiar With The Pages That Are Generated by EasyBlogs......including what and when to upload and RE-upload" and you won't have to wait for an answer here. Q7. XML It! is giving me the following error message: "Sorry, one or more files from your domain that you have selected are NOT referenced in your XML file. You cannot upload the following files through "XML It!" A. First, make sure you have built all your pages FIRST and that they are uploaded using the HTML upload feature following the tutorial in the manual BEFORE you use XML It ever! Use XMLIt ONLY for the xml page... re-upload all HTML pages in QuickReUploadIt FIRST and ONLY then, go to XML It and re-upload the xml page ONLY. People get the error message because they do not know EXACTLY which pages are listed on their xml page and therefore, cannot respond to XML It's need to be exact with this information. Again, the work around is to NEVER use XMLIt to re-upload your HTML pages. Use it ONLY for the rss.xml page.......!!!!! Q8. I am getting URL not found for some pages of my blog pages. 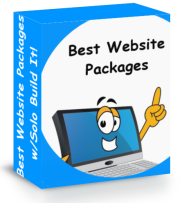 The software generates the pages but YOU have to get them onto your SBI website just like you did the home page of your blog ....or any other page on your SBI site, for that matter! Note: If you are absolutely sure that you uploaded (and clicked the Build button) the page(s) and you are still getting the No URL page, then be sure to check your settings in Options (in the Easy Blogs software). Compare your settings to the screenshots in TUTORIAL II : Setting Up Your News Blog to make sure you have all the settings correct. Check ALL options including > Basic > Advanced > RSS ! Q9. Why can't I use QuickReuploadIt to re-upload my RSS/xml feed? A. Something changed with QuickReuploadIt when RSS/BlogIt was installed at SBI, so now you MUST use XMLIt to re-upload your RSS feed, every time. Q10. There is a file called, recent.html, in my Easy Blogs folder. What do I do with this? A. The recent.html page is a page that displays all of your recent entries. If you have your blog home page set up to show recent entries (see above), then this page has no value and does not need to be uploaded to your SBI website. Q1. What Do I do if the links for my blog in My Yahoo don't work after I add my RSS feed to the Yahoo Feed Directory? A. Check all the settings in your options. Find the Options button on the left nav menu in Easy Blogs, go to Options and check all your url's and file names for typing errors. Make sure your Blog URL is just your domain name and nothing else and double check it to be sure it is typed correctly (better yet, copy and paste what is there into a browser to check it). b.) Be sure that you do not type in .html in the Index Page Name box. ONLY the name of your file just like you do it in Site Central when you are building a page. Make sure your Channel Link in the RSS Options is typed correctly (better yet, copy and paste what is there into a browser to check it). After you correct everything, be sure to re-publish, re-generate, and re-upload your rss page. Then, in your My Yahoo, you MUST delete the feed from your My Yahoo home page and add it back in again to see the corrected urls. Q2. My RSS feed on My Yahoo home page is not updating after I ping. What is wrong? 1) You have not refreshed your browser (look for the refresh option in your browser menu). Q3. When I click on my entry links in MyYahoo (or any other RSS feed reader), I get a no such URL page. 1. Every new month requires that you upload for the first time, the new month's page generated by the software. You will get a no URL page if you have not done this. You CANNOT re-upload this page for the first time. It must be Uploaded at the first of the month. Pleeeease read this tutorial, Getting Familiar With The Pages That Are Generated by EasyBlogs......including what and when to upload and RE-upload to get this right every time! 2. You put the wrong information in the Basic Options for your "Blog URL." This should ONLY be the URL of your SBI website and nothing else. In other words, for your Blog URL in Basic Options, you should only have: http://www.yoursbisite.com and nothing after it. Go back to Tutorial II: Setting Up Your News Blog in the manual to see the screenshot for this step and find it under Basic Options setup. Q4 How come I don't find my RSS feed listed in the Yahoo RSS directory even after I have added it to the directory? My guess is that you are not looking in the right place. Re-visit the chapter in the SBI Rss Tutorial called, Get Your Blog Indexed by Google in Just 10 Day Using This Secret Step. Step 8 says that you need to search in theFind Content search box. If you try searching in the Web search box of Yahoo, you won't find it there. This method puts your RSS feed in the RSS directory only. One other reason would be that you are not searching on the keywords that you used in your blog title. Other than that, if you still are not finding your RSS feed, then please contact Yahoo support. I can't help you after this so please do not post a support request regarding this issue! Q1. If we put Google AdSense on our blog page and we offer syndication to other sites will our Google AdSense ads appear on their sites? Q2. Can I Put more than one blog and RSS feed onto my SBI site? A. Yes you can! The new update of the software in Oct. '05l now lets you put more than one blog on your SBI website. You will need to take care to make sure you don't re-use existing file names like "articles", "archives, "categories" and archived pages. Q3.I am using an SBI template and I want the Navigation buttons from my SBI site to show up on my blog. A. You can insert the code ***NAVBAR*** into the section of the template where you want the buttons to appear. To replace the Easy Blogs navigation menu look for this code [%links.navbar.column%] and replace it with this code; ***NAVBAR*** it should look like the example below. Q4. In Search Engine HQ, I am getting this, "custom keywords by default" for my keywords. How do I fix this? 2. Go to Options ==> Custom Variables and set your default keywords and description. See this tutorial on how to do this. Note: Be sure to Re-publish, Re-generate AND Re-uploadALL pages affected to see the changes in SE HQ! Q5. Can I insert AdSense code directly into an entry box when creating a blog post or article teater for my dedicated blog? A. NEVER add Google AdSense code inside an entry box including the Home Page entry form. Why? If you turn on the feature to have the software format entries for you then it will insert line breaks for you automatically (found in Advanced Options). This feature then inserts the <br> tags into the Google AdSense code and renders AdSense useless. Not to mention the RSS feeds will strip it out anyways. AND it may be against AdSense Terms of Service. I highly recommend you DO NOT do this. DO select this option below. Google AdSense has invented "Ads for Feeds." This new feature is ideal and intended for blog feeds. To add this to your blog. Put your code in the 'After Entries" tab of the 'Default" pagetype in the "Template Editor". NOTE: If you want to add AdSense code to your pages other than in the location that I have designated in the manual tutorial, Mini-Tutorial : How To Insert Google AdSense Into Your Template of the SBI Rss Tutorial, then you can do so on your own.....please be advised that you will need to know enough HTML code to be comfortable placing the AdSense code in your template other than where I have placed the markers. Please note that I do not provide support for any HTML modifications to the templates. One thing I will remind you to do before attempting any template modifications is to always save a copy of your existing template before you attempt any HTML coding changes. Q6. Do I still use the Easy Blog rss feed or just use RSS/BlogIt's feed from now on? A. Both, These are 2 different rss/xml files. When you upload your pages (especially article pages) you can add them to the Rss/BlogIt feed. Don't forget to use XMLIt! for your Easy Blogs feed too. I even like to add my archive pages to Rss/BlogIt! at the end of each month. Q7. Should I take the orange RSS button for the Easy Blogs RSS feed off from my blog template and put the RSSIt button there instead? A. Mmmmm, your might want to and then, again, you might not. Read To Remove The Orange RSS Button/ Link To Your Easy Blogs RSS Feed...or NOT! and then you decide. Q8. Do I need to re-submit my rss feed to RSS directories more than once? A. Yes, you do need to put yourself on a schedule and resubmit every other month. This is easy with the free RSS Announcer software! 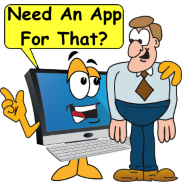 See the tutorial FREE-TO-YOU DIRECTORY SUBMISSION SOFTWARE! in your package. Q9. How do I get rid of the RSS/BlogIt orange button on the left nav bar? A. Go to RSS/BlogIt in SiteCentral. Scroll down to the question: On which pages do you want the RSS/XML button to appear? and select "Home Page only." Before you do that read this tutorial...orange-rss-button. Q10. How do I remove the Easy Blogs orange RSS button from the blog pages? Q11. Can I put Google AdSense after every entry. Can't find what you want here? Check out the SBI Rss Articles.